Club Ten Pin Bowling Champion Team - 2008! 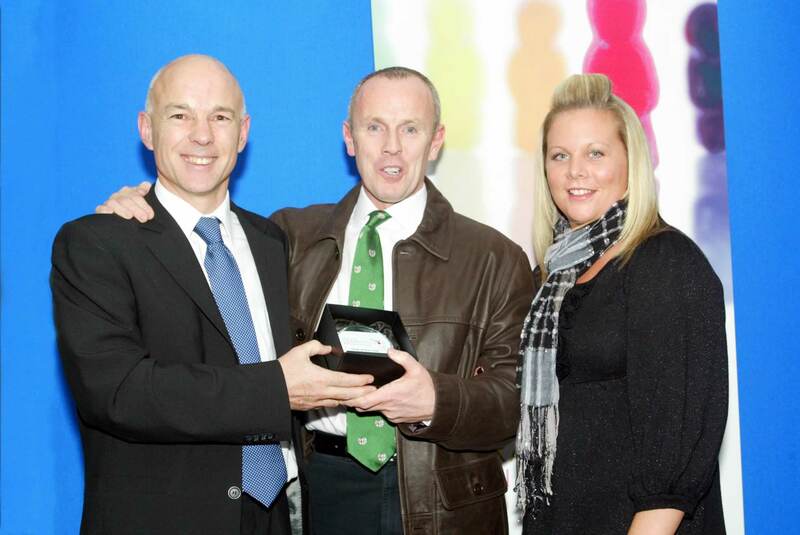 Ladywell win Inaugural Sports Club of the Year Award! Every year in early October, the culmination of almost a year's hard work manifests itself in the London Festival of Gymnastics, held at The Brentwood Leisure Centre, Essex. A group of gymnasts and coaches from the Club traveled to Malta on 17 July to attend the Gymstars International Invitational Competition. The heady mix of a beautiful location, fantastic weather and warm local hospitality ensured the party had a wonderful stay in Tarxien. The Competition Results are available for viewing here with a page of photos' available here. Ladywell Annual Club Championship's are a huge success! A brilliant turn out from both parents, family members and gymnasts ensured that the fifth Annual Club Championships turned out to be a resounding success. For many of the gymnasts this was their first ever taste of competition and despite a few nerves, they all performed brilliantly on the day in front of their highly appreciative audience. A full list of results and photos' are available here. 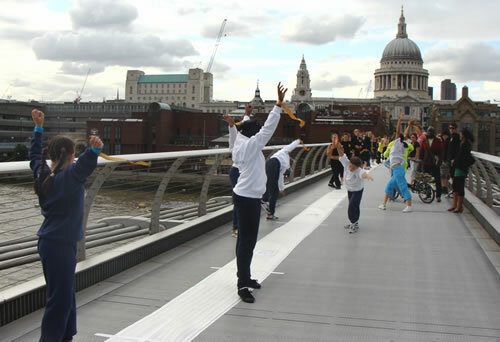 A Truly Unique Event was held recently over the River Thames when members of the Club joined other gymnasts, artists and cheerleaders to perform a series of cartwheels across the infamous Millennium Bridge. The event marked the beginning of the London Dance Festival. A selection of photographs taken at the event and some background are viewable here. A Fun Day was held recently beside the Club premises in support of the fund raising effort to send a Team to the International Competition in Malta. Thankfully the weather held and the event proved a roaring success - as can be seen in the collection of photo's on display here. 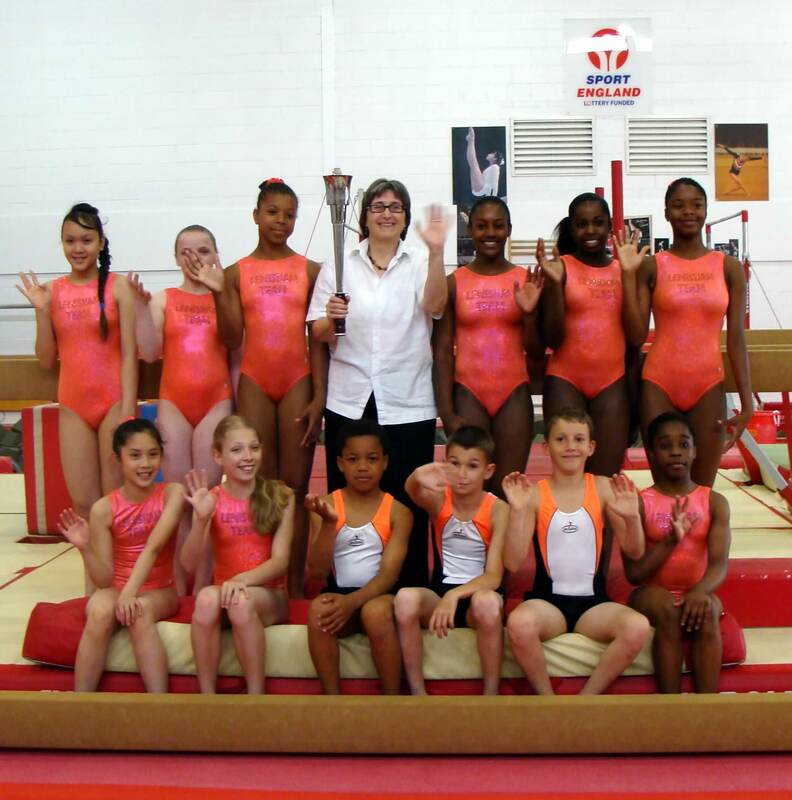 The London Youth Games Torch, lit recently by London Mayor Boris Johnson, has paid a visit to Ladywell Gymnastics Club, which acts as the Training Centre for the Lewisham London Youth Games Gymnastics Team. The Torch was on a whirlwind visit of all the London Boroughs'. In the photo above, Lewisham Councilor Chris Best, a member of the 2012 Forum, holds the Torch, surrounded on this occasion not by burly Chinese Minders, but by members of the Lewisham London Youth Games Gymnastics Team. Four Ladywell gymnast's brought their hard training to bear at the LGF Bronze Competition, held at Heathrow Gymnastics Club. Well done to Ophelie Zahui and Gemma Simmons for winning Gold and Rhyanna Banton and Bryony Gill for winning Silver Medals. Check the Results Page for more details. Three Ladywell gymnast's certainly rose to the occasion at the LGF Bronze Competition, held at Cheam Gymnastics Club on 19th May. They each won the Gold Medal! Well done to Quynh Trinh, Darcy D'wan and Antonia Patterson. Check the Results Page for more details. 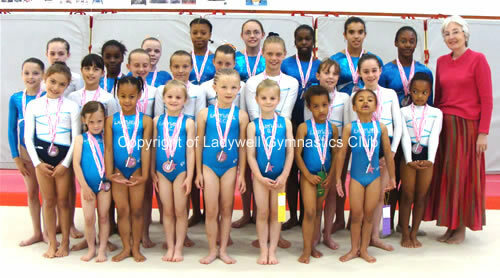 Ladywell wins Gold at Regional Senior Team Championships! 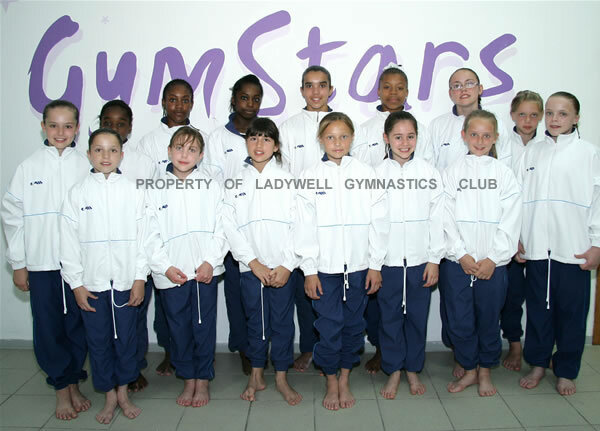 Ladywell won the Gold Medal at the Regional Senior Team Championships at a competition held at Heathrow Gymnastics Club on 11th May 2008. So dominant were our team that we were more than six points clear of our nearest rivals. The Team consisted of Bryony Gill, Rhyanna Banton, Gemma Simmons, Chelsea Cherry and Ophelie Zahui. A fantastic effort girls - Well Done. See the Results Page for score details. Ladywell gymnasts put up a fantastic multi-medal winning performance at the LGF Spring Competition, held at Heathrow Gymnastics Club over the weekend of 19th, 20th April. Check the Results Page for more details. Club stalwart Bryony Gill has won a Gold Medal at the LGF Regional Club Grade 3 Competition, held at Heathrow Gym Club on 03rd March 2008. This success is the culmination of many months of hard work and Bryony has done herself, her family and the Club proud. Well done Bryony. Ladywell wins Club of the Year at top Awards Presentation Night! The inaugural Pro-Active London 'Celebrating Sport & Physical Activity' Awards, held on 14th March at Chelsea Football Club, proved to be an auspicious night for Ladywell, as to our great surprise and delight we won the prestigious and coveted Club of the Year Award. When Richard Sumray, the Chairman of the London 2012 Forum announced that Ladywell had won the top prize of the night, nobody was more surprised than the two Ladywell Staff members in attendance, Frank and Nicole. The award was presented to generous applause from the large audience by Mr John Brewer, Chairman of the London Regional Sports Board of Sport England. Eight major awards were presented on the night to nominees representing sports clubs in a multitude of sports from all of the London area. The two guest motivational speakers were former World Boxing Champion Duke McKenzie and Olympic Shot-Putter Judy Oakes OBE.